Marine Life Park opened to the public last Thursday, 22nd November 2012. While there is no further construction taking place at the park, the from the air series will continue as we take an extended look at Marine Life Park’s Adventure Cove Waterpark in operation. The opening of the world’s largest Oceanarium was blemished with the unfortunate passing of Wen Wen, an Indo-Pacific Bottlenose dolphin. This dolphin died en route to Singapore. A candlelight vigil and memorial service will be held for the dolphin on 2nd Dec 2012. The remaining 24 dolphins (from the original group of 27) are now at the Dolphin Island section of Marine Life Park, acclimatizing to their new home. 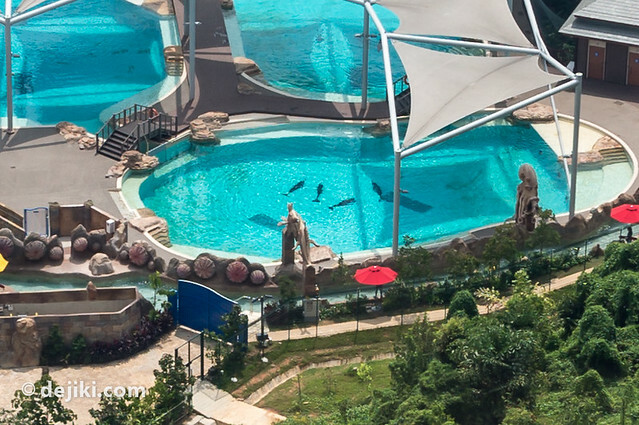 The loss of another captive dolphin has stirred up the angry nest of animal activists, causing Resorts World at Sentosa (RWS) Facebook Fan page and local news websites to be flooded with comments, urging for the release of the remaining 24 dolphins in captivity. Note: My blog entries on Marine Life Park are here to provide coverage and share content that other sites do not offer. These entries are produced for documentation purposes and as personal reviews and trip reports of Marine Life Park. I do not get paid by RWS. While I enjoy taking photos and blogging about attractions, my entries are not direct endorsements for Marine Life Park. I am not oblivious to the issue of dolphin hunting and dolphins in captivity, having viewed campaigns and research findings by activist groups as well as the responses by the Marine Life Park. Edit 29/11/2012: Please do not jump to conclusions on the overall enclosure size for the dolphins, or the living conditions in the enclosure, because these details cannot (and SHOULD NOT) be inferred solely from the photos in this entry. Inside S.E.A. 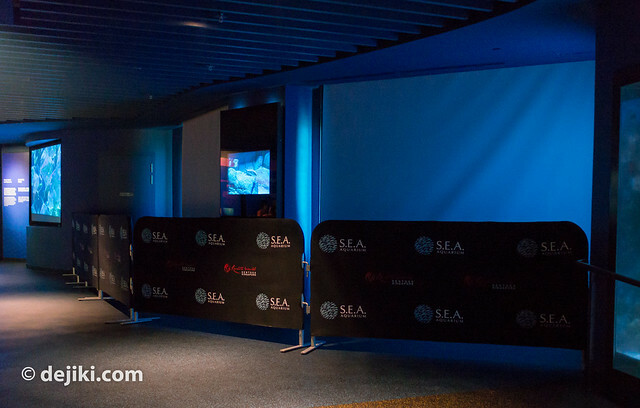 Aquarium, the viewing panels at the Dolphin Island zone have been covered up. The dolphins are swimming in that particular pool. Dolphin Island consists of several connected large pools. 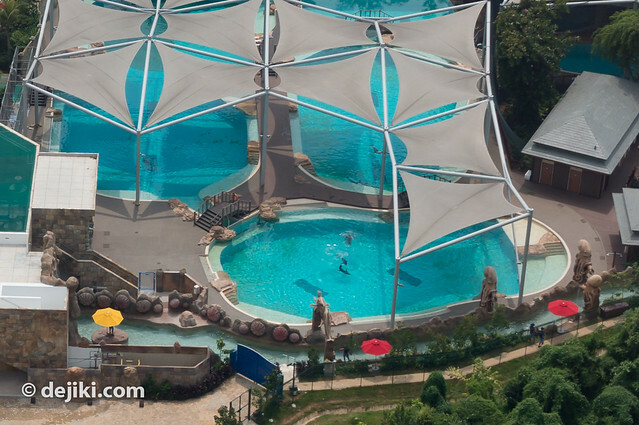 While these pools cannot be compared to the dolphin’s natural habitat, collectively they form another mega tank in Marine Life Park. I have the layout map of all the pools and I’ll post it in the next entry. Let’s look at these three connected pools. Edit: There are other large pools, these are just three of them. 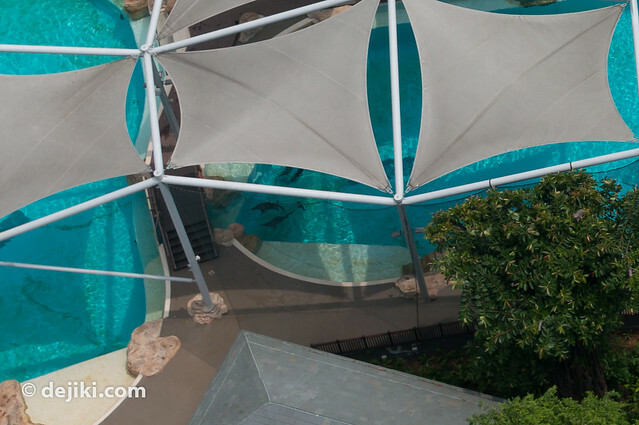 Please do not jump to conclusions on the overall enclosure size for the dolphins, because I do not have photos of ALL of the pools. There are a handful of dolphins in each tank. Obviously, not all 24 dolphins will be placed in just these three tanks. The other dolphins are in the other tanks not shown in these photographs, including two tanks within the Grotto (aka rock building). 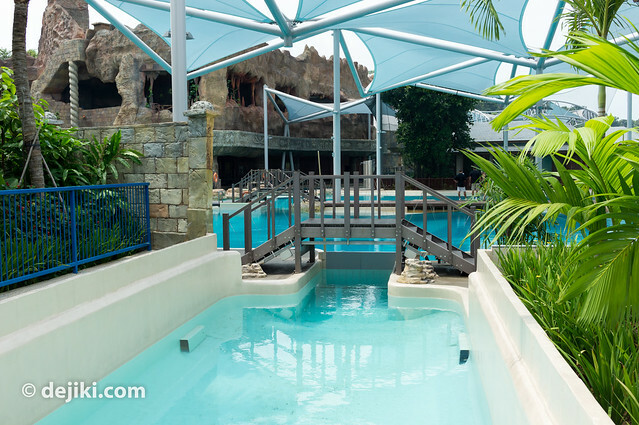 The pools at Dolphin Island are linked at certain points, with gates like this. 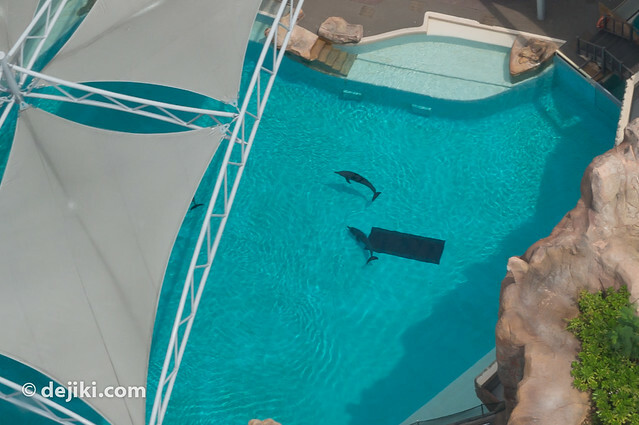 The dolphins are currently undergoing quarantine and acclimatizing to their new home. 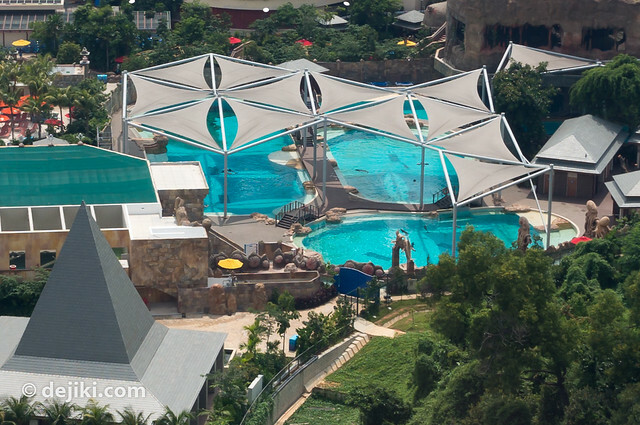 RWS said that guests will be able to view the dolphins in S.E.A. Aquarium next year. 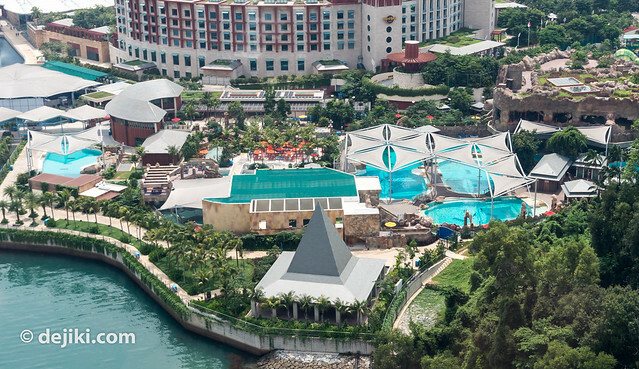 Adventure Cove Waterpark will also have a dolphin interaction programme at its Dolphin Island area. I think the major studies done on not only Dolphins but also Killer Whales (Orca) in captivity have proven that not only are survival rates significantly different to those living in the wild but also that we can hardly claim, as has been done in the past, that the animals are being “rescued,” “held for educational purposes” or indeed “better off in captivity than the wild.” These animals are telling us in their actions and their health status that captivity does not suit them. Rather than the billions of pounds used in the “entertainment” industry surely it would be financially more viable, ethically more sound and educationally more beneficial to study these animals in their own habitat? A cynical ploy, at the expense of a creature meant to be wild. Hi..at this moment in Taiji(japan) …a pod of Dolphins is getting destroyed..its day 5 for these poor creatures and already 94 were taking captive for parks like yours…They have had no food and are traumatised..2 babies drowned in the nets..and the ones which wont be selected will get killed..shame on you for doing this..its disgusting..
Is this the same as UnderWater World back then? Still waiting for that next entry!